"I WAS BORN TO FOLLOW LIVERPOOL FC"
Gerry Blayney has been through highs and lows supporting his beloved Liverpool Football Club. From the glory of watching the reds win countless trophies to the death of relatives and friends, he has seen it all. Here Gerry recounts his exploits following 'the redmen' all over the country and into Europe, with typical scouse wit. From a young lad watching his heroes battle their way out of the Second Division to the glory of the all-conquering Liverpool team of the 70s and 80s to the improbable glory of Istanbul, Gerry has seen nearly all of it in a Liverpool 'career' stretching back to 1956. He also lost his son in the Hillsborough disaster and his best mate in a car wreck on the way back from an away game. Somehow has soldiered on and as Gerry himself states, he wouldn't have been able to get through it without the help and support of the Liverpool football family. Born and raised in Liverpool, Gerry Blayney has supported Liverpool FC all his life. He was voted the club's official 'Supporter Of The Year' in 2001 and is friends with many club legends past and present. 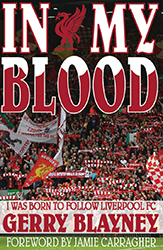 'In My Blood' is his first book.